The meeting was the third in our Lone Star Tour, comprised of three such events in three days across Texas. The Webster event was organized by Scott Apley and supported by the Clear Lake Tea Party. Marc Levin with the Texas Public Policy Foundation kicked off the event, speaking about criminal justice reform. He gave a recap of reform efforts during the last Texas Legislative Session and plans for the upcoming session. 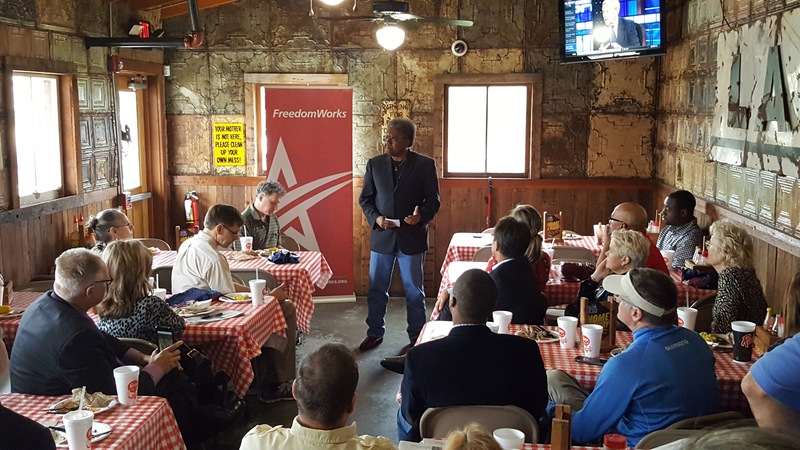 FreedomWorks and the Texas Public Policy Foundation are partners in justice reform efforts. Empower Texas was represented by Charles Blain, who spoke about the group's goals for the upcoming state legislative session. I was pleased to share information about FreedomWorks; who we are and what we do, our signature initiatives and our upcoming action items. FreedomWorks Senior Fellow, Reverend C.L. Bryant, wowed the crowd with a message that Clear Lake Tea Party Leader, Dale Huls said "makes me proud to be an activist!" A special thanks to Scott Apley for organizing this informative event.